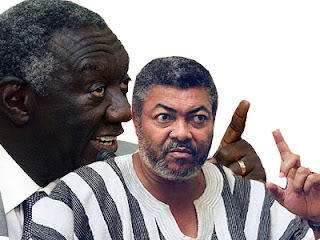 Former President Jerry John Rawlings has declined an invitation by President Kufuor to join him and other dignitaries at the Independence Square to celebrate the Golden Jubilee celebrations of Ghana's Independence on March 6. "I deeply regret that I cannot therefore join Kufuor’s government for this anniversary. Message From Flt Lt Jerry John Rawlings, Former President Of The Republic Of Ghana, To The People Of Ghana And All Well Wishers Of Ghana On The Occasion Of The 50th Anniversary Of Ghana’s Independence FELLOW GHANAIANS both at home and abroad, Dignitaries and most especially Heads of State and all those friends of Ghana who have come to Ghana in a spirit of goodwill to share in the nation’s 50th Anniversary . As a citizen of Ghana and a Head of State for almost two decades of our 50 years of Independence, I deem it my responsibility to share my thoughts with you with frankness and sincerity, on the occasion of our Anniversary. First of all, I join all of you in thanking our Creator for bringing our dear country to the mature age of 50. I honour and respect the memory of the late Osagyefo Dr. Kwame Nkrumah, the patriot and freedom fighter, who not only led this country to independence from colonial rule but also laid the foundation for Pan- African freedom on our continent and in the diaspora. I wish also to honour all those valiant men and women who made sacrifices in various ways, as well as those who lost their lives during the struggle for our independence from colonial rule. And I honour every decent, hardworking Ghanaian citizen - our farmers, teachers, nurses, doctors, security personnel, market women, all workers, the numerous unemployed, who have struggled to hold fast to their principles through the hardships, frustrations and intolerably stressful circumstances under which they have had to exist and manage their lives today. I welcome the very many foreign dignitaries who have taken time off their onerous responsibilities at home to be here for this anniversary, especially those who have played significant roles in the struggle for justice in Africa. But I am compelled to ask: “What is being celebrated?” I am not alone in asking this question. Many people have already asked these questions. Dr. Kwame Nkrumah achieved independence for us 50 years ago by winning freedom and justice from white colonial rule. Many traumatic events have occurred after that culminating in the spontaneous uprising in June 4, 1979, which attempted to wrestle freedom and justice this time from Black Neo-colonial rule. The early days of the PNDC government were times of great sacrifice but by the time we, as NDC, a political party, handed over power to the present Government, we had restored Ghana’s pride and had regained the respect of the international community. When therefore we handed over power to the present government, we wanted a genuine cooperative handover, a milestone in Ghana’s political history. Instead, we were criminalised and we continue to suffer indignity and persecution. In what sort of country do we celebrate this 6th March? Ghana is faced with pervasive corruption at all levels, missed opportunities for genuine progress, nepotism, tribalism and known cases of political torture and killings. There is also decay of our local industry, the breakdown of our educational system, and an empty façade of “good governance” which earns the applause of those who seek to control us. I deeply regret that I cannot therefore join Kufuor’s government for this anniversary. My conscience and my principles will not permit me. I cannot share the same platform with the same people who have taken every opportunity to denigrate us for the last seven years and see no good in what we did for this country. And I cannot be part of a cover up for the defilement and violations of the principles of self respect, pride and hope that underlie 6th March 1957. I repeat my criticism of certain international powers, as well as sections of the international and local media, who have tried many times to gloss over or cover up the difficulties we face in the country today, all in a bid to whitewash the present government. They will, in the long term, be doing the people of Ghana a great disservice. To them, I say that I cannot relinquish my present unshakeable belief that Ghana is merely being made a “show-case” whiles so many people are being denied the basics of life and their freedoms but cannot find the courage to speak up because they have been terrorised into a state of subjugation. A planned peaceful vigil and procession by followers and admirers of Kwame Nkrumah to commemorate the anniversary has even been disallowed and threatened by this government. So fellow Ghanaians, let us soberly reflect on our present circumstances; let us make this 50th Anniversary of our Independence a pledge to each other to consolidate social justice, integrity, honesty as the basis for the years ahead. Because when all the celebration is over, we still have to ask ourselves where we are going to get our next job, our next meal and money for rent and our children’s school fees and hospital fees. WE ARE GRATEFULL iSAAC. ITS GOOD WE KNOW WHAT TO DO FROM HERE. i KNOW THIS CELEBRATION WAS A HUGE COVER-UP. Good Rawlings has said all that he said. any landline phone number and get complete access to a big database of user information.